This wins the award for staying longest in my drafts..and I never thought about posting it now when there is no time to make such an elaborate dish. However, during the month of shravan, there are several occassions that call for sweet recipes. I made this under the watchful eyes of MIL, or rather to be honest...I was helping her out. 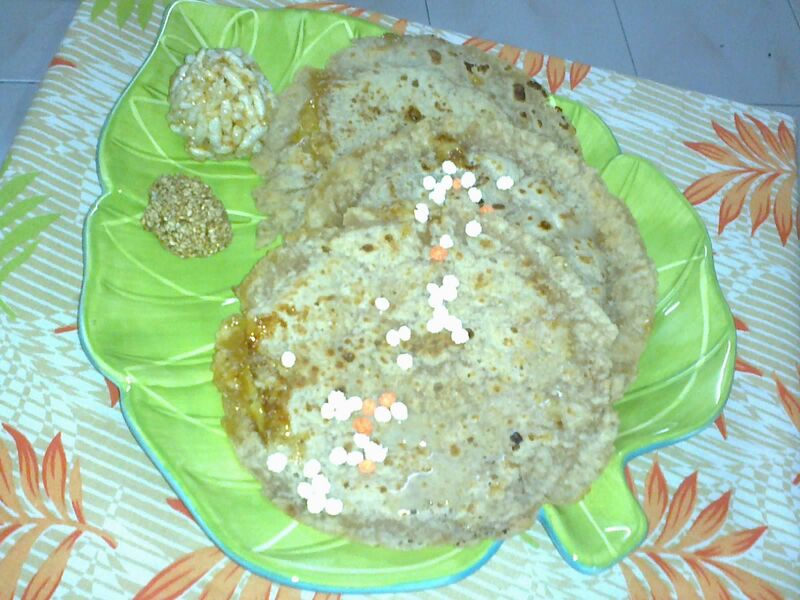 I am bit jittery when it comes to trying super traditional recipes on special days. But I noted every possible detail...so the recipe is foolproof. 1) In a large basin, add the flours. 2) Prepare a well in the center to add hot oil. 3) Add salt and mix it using a spoon. 4) Add water as needed to a soft dough. 5) Cover the dough with wet kitchen towel and set aside for minimum 30-40 min. 6) In another bowl, take the grated jaggery , break any lumps by hands. 7) In a non stick frying pan, roast the sesame seeds, Let it cool in a plate. 8) Next to the pan, add the gram flour and roast it till it changes color to deep golden. Taste it to check whether the flour has lost is rawness. Roasting this correctly is key to the dish. 11) Take the dough and knead it well using more oil if required to make a stretchy soft dough. 13) Roll each dough to the size of puri. 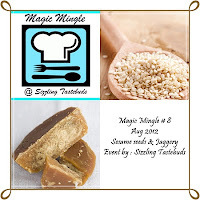 14) Place the jaggery filling in the centre. 17) Carefully lift and place on a hot griddle. Excellent and super healthy flat bread, wish to have some rite now. Looks yum Pradnya. Happy Independence Day dear.